Up Late at State Glow it Up! 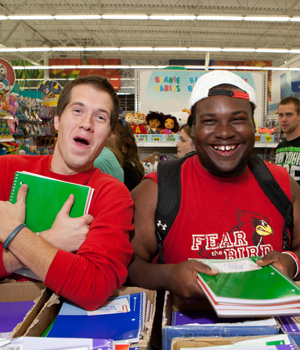 Following your participation at Preview or Transfer Days, Welcome Week is your next step in preparing for life at Illinois State. 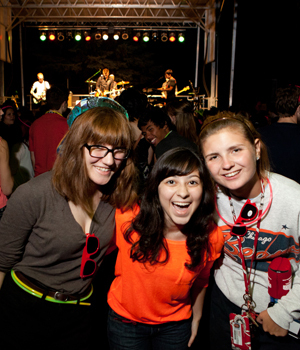 Welcome Week is both for incoming freshmen and transfer students. Welcome Week starts on Wednesday of move-in and continues through Sunday. Social activities begin Wednesday night with a casino night and continue every day with events such as Quadchella, Reggie's Karaoke BBQ, campus community service project, Up Late @ State, and Redbird Athletics. In addition there will be free shuttles to Meijer on Friday night so you can purchase groceries and room decorations. Friday will focus on academics, as all new students are required to attend What It Means To Be a Redbird, a theatrical performance highlighting university values and expectations, and academic department meetings. These meetings will allow you to meet other new students who will be in some of your classes. For those students participating in shared experience, you will discuss the books you were asked to read over the summer. Welcome Week is a fun way to learn more about ISU. You will meet other students, learn about campus resources and services, and get to know the Bloomington/Normal communities. Your participation in Welcome Week will not only provide you with the tools you’ll need to be successful at the University, but will also help you make Illinois State your “home away from home.” Welcome to the Redbird Family!